February 28, 2018 – The foundation for Lockheed Martin’s satellite production factory of the future has been completed. The Gateway Center construction is making rapid progress and is on track for its completion in 2020. The project recently reached a significant milestone, when the construction team began installing vertical structural steel. The $350 million, 266,000 square foot building will incorporate multiple features under one roof, and is designed to streamline satellite production and increase cost savings for both government and commercial customers. The building will house an ISO Class 8 high bay cleanroom, an anechoic chamber, and a large thermal vacuum chamber to conduct dynamic endurance tests on the satellites. “The transformation of this site in just a few short months has been remarkable,” said Bill Breeden, vice president of Assembly, Test, Launch and Operations at Lockheed Martin Space. 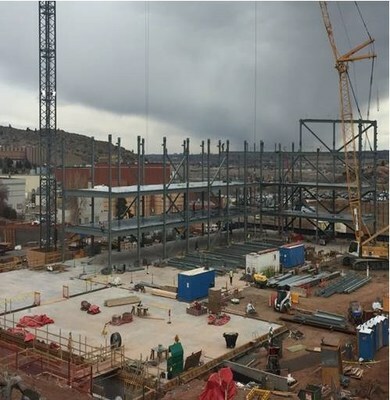 “The basement level has been excavated, the concrete foundation is laid, and we’re already raising the steel beams that make up the backbone of the structure. We’re well on our way to a 2020 grand opening, when this new facility will be primed and ready to manufacture a wide range of state-of-the-art satellites with agility, precision and efficiency,” noted Breeden. The Gateway Center will be capable of producing multiple satellites at the same time. Embedded functions of the building will reduce satellite production processes from days to mere hours. The building is value engineered and will integrate industry best practices for satellite manufacturing. In the months since the groundbreaking, over 100,000 cubic yards of soil have been moved to make way for the project. This equals enough dirt to cover an entire football field with a mound 60 feet high. To prepare for the foundation construction, over 500 caissons and support beams have been drilled and installed in holes up to 30 feet deep. Upon completion, the Gateway Center project will have used hundreds of structural steel beams weighing nearly 2,200 tons. Lockheed Martin has undertaken considerable initiatives to maximize the energy efficiency of the building, and conserve the native landscape. The project is also producing jobs for the local economy. Over 1500 skilled contractors are expected to work on the Gateway Center during the construction phase.